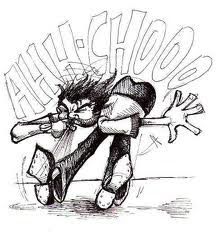 I was very young when I first discovered that I have the photic sneeze response, which is present in 18-35 percent of the population, according to Wikipedia. Basically, when a person who has the photic sneeze response looks at the sun or a bright light, it'll sometimes make that person sneeze. It'll come on suddenly, like when you're sitting in the sun, next to your wife, who is relaxing and calmly enjoying a glass of wine as she reads a little Jose Saramago, and all of a sudden, KERBLOOEY!, you go off courtesy of the photic sneeze response. And KERBLOOEY! again. And yet another KERBLOOEY!. Or maybe you'll be driving along in the car and all of a sudden you turn your head slightly to the left where the sun is and you'll get a little tickling in your nose and then, KERBLOOEY! All this while your wife again sits calmly staring forward, looking at the scenery, as if three or four wild sneezes in a row are not bothering her. Because she is the pluperfect spousal unit and queen of your existence. Or maybe she's super nice and all, but somewhere deep down my pluperfect spouse harbors complete and utter resentment and anger related to those times when the photic sneeze response rears its ugly head. I have actually suspected this all along even though she puts on a good face about it. Because last week while working in our yard on a lovely, warm pre-spring day, in overcast weather, the sun suddenly peaked through as I dug yet another behemoth hole for planting some new plant that she had purchased at the Chinese garden or some off-the-wall plant sale. And then.... suddenly.... I feel the tickle. (Insert Jaws music here) I turn my head slightly and raise it to the sky because the photic sneeze reponse is calling me to do so. And then as quick as lightning, KERBLOOEY! I look at Marie. She has the look of whatever on her face. I try to dig more. And then without warning, as I look up slightly again, KERBLOOEY! I glance at Marie again and her eyes are closed but her face looks calm. I lift my spade and try to continue my excavating. And then once again, without warning, as I raise my head to the warmth of the sun, KERBLOOEY! At that moment, I fear my perfect spouse's true feelings came forth. Because after that third sneeze she gave me a look, a staring look that said, "that is the most irritating thing I have ever experienced since the day I was born". And then she uttered these words. Words that I will never ever forget, as she stood holding a potted plant in her pink garden gloves, and sporting a little brown smudge of mud on her left cheek. (Stop Jaws music). "Ric" she spoke, "Quit lookin' at the goddam sun". So I wrote a song about it. It's called the Photic Sneeze Response. And it's a rockin' little ditty. Featuring my buddy Tim Ellis on guitars, as always. If you're a photic sneezer, this one's especially for you!